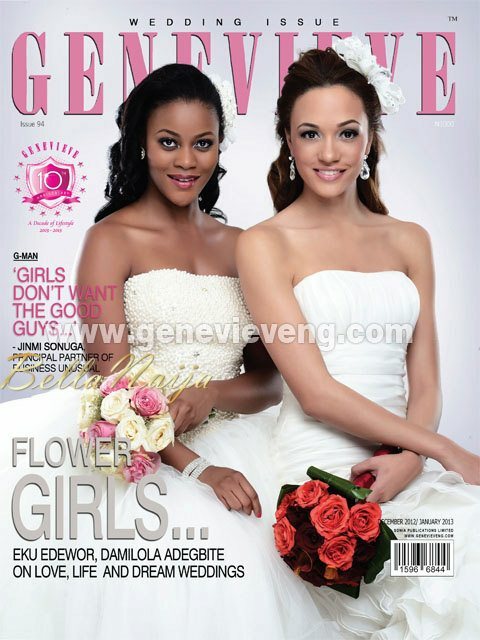 It’s December and Nigerian lifestyle publication, Genevieve is out with the 2nd edition of its wedding issue with former Tinsel star, Damilola Adegbite and Studio 53 Xtra co-host, Eku Edewor, gorgeous in white ball gowns with beautiful bouquets on the cover. 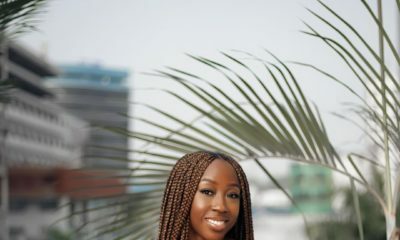 Last year, supermodel and mom, Ojy Okpe graced the cover of the magazine’s wedding issue, where she dished all things Ojy. 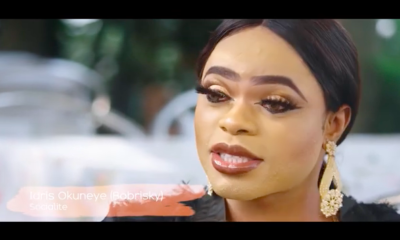 Now its time for Damilola and Eku, who star in the soon-to-be released romantic comedy flick by Michelle Bello set to be released on Valentine’s day, who speak on love, life and their dream weddings. And we certainly do agree, pick up the latest issue of Genevieve for all details from these blushing brides. Awww! They look soo pretty! Mucha luv huns! This is so pretty,give me sum Eku slender,tender bones any day any tym…. LMAAAAOOOOOOO but why this essay nau? SMH HOW IGNORANT! YOU NEED TO SHUT THE HELL UP BCOS A BRIDES WEDDING DAY IS MEANT TO BE A DAY OF HAPPINESS FOR HER & I RECKON SHE SHOULD BE ALLOWED TO PUT ON WHATEVER STYLE OF DRESS SHE FEELS COMFORTABLE, CONFIDENT & HAPPY IN…NOT EVERYONE IS A SIZE 0-10 & I TRUST NOT EVERYONE WANTS TO STARVE THEMSELVES OR HAVE THE TIME TO GET TO THAT SIZE BEFORE THAT SPECIAL DAY ALL IN THE NAME OF “LOOKING RIGHT IN A TUBE DRESS”!! AS LONG AS THERE ISNT ANY INTENTIONAL INDECENT OVER EXPOSURE, I SAY GO AHEAD BRIDES, NO MATTER WHAT SIZE YOU ARE, WEAR WHATEVER PLEASES YOU & BE BEAUTIFUL!! This your question mark sha. Hope all is well? Yes, go ahead and wear what you want! but you wouldnt want to look at your photos in a few years and say “damn, you b*tches didn’t tell me that I looked like chicken shawarma on my wedding day”. That’s why you should wear things that flatter your body type or feel very comfortable in. ehn, but you can say what you want to say without shouting now. haba! …and who made you the wedding whisperer??? u sound pained! weddings are about the individuals and their individual modes of expression, if that makes u uncomfortable find d nearest pothole to go swim in!..see him/her yacking bout no this, that n d other…in ur mind u’ve convinced urself that u’re knowledgeable… oshi! girl I couldn’t agree more.. Also flower girls are between the ages of 5-9 not grown women ! ….and who made you Lord over what anyone can wear to their wedding? What a bride wears may not be visually pleasing to you but as long as she is happy, weting consign you there. This one wey you come write dissertation on top wedding dress. Mcheww, abeg carry your self and go sit in a ditch. exquisite is the word. beautifully executed. @Truth, haba! Comments is right- the dresses on these actresses only suit very thin people and also right about the make-up, go simple as less is more! True, it is good to be happy on your wedding day but come’on, you only get married once so why not keep things simple and well fitting rather than going for stuff that don’t suit? 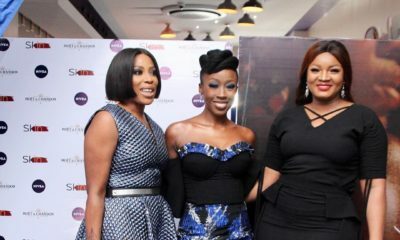 That said, I love Damilola’s beautiful coco skin- black is beautiful! Lovely! i agree with some of @Comments eh..comments! People should make better wardrobe choices and not assault peoples sensibilities in ill fitting clothes, not all styles flatter all body types and all FASHION ‘WEAPONED’ AGAINST YOU MUST NOT PROSPER(there’s enough UGLY around please!) in this case brides! Beautiful ladies I love . Eku add just a little flesh and that’ll be cool but you two are so pwetty. I love their quotes on love. Beautiful ladies. Anyone telling Eku to add a little flesh needs to fall all the way back. She’s gorge as she is! Damilola just out shines on this cover! @Comments, you’ve written well – that’s constructive [email protected], you’re either FAT and bitter, or fat AND bitter. what better mature way of getting your message across, Shame on you!!! @Comments – I totally agree! Some people do have a patent on sarcasm sha.. constructive criticism given in a manner that is anything but! politeness and a bit of kindness never hurt anyone oh. they are so pretty. i prefer Eku’s gown to Damiloa’s gown, jst saying. Love the cover, both ladies look gorgeous and what lovely dresses.